A very funny and creative film about people with emotional problems who find ways to get their lives together. This is a fantastic movie in just about every way. From it has broken characters that are each funny and unique characters to its wild situations. The movie is about a guy who has just gotten out of a mental institution and is trying to put the pieces of his life back together. He meets a girl whose husband just died, and this guy, pat, cannot stop reminding her of that. His dad is a football fanatic who is devoted his life to gambling on the eagles and has even been kicked out and banned from the stadium for beating people up. There are so many humorous relationships in this film, and it all comes together perfectly. Both Bradley cooper and Jennifer Lawrence have never been better. Deniro is great too, although it takes a little while for his character to really get going. But best of all are the storylines and situations. Just look at pat’s friends, a guy who is miserable with his wife and hides it from the world, and Chris Tucker who is constantly running away from the institution. There’s a lot to like about this movie. Silver Linings Playbook is a lot of fun. It’s kind of a psychological romantic drama if there’s even a such thing. It’s also a hell of a black comedy. This movie crosses over genres, which is a main part of its appeal. Movies that have the main character hold sessions with a therapist throughout the film, and that takes this seriously, are usually pretty great. From good will Hunting to ordinary people, we tend to get wonderful conversations out of those one on one exchanges. 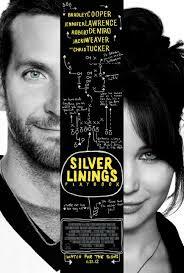 Silver Linings Playbook joins those other films. The movie is about a guy who is just coming home from a mental institution to stay with his parents. His mother actually checks him out a little early. She takes him out based on what the judge originally decided should be the amount of time he stays there, but without getting an opinion with the doctors who have been working with him ever since. The main character is pat, played by Bradley Cooper in what is probably his best performance to date. Cooper usually plays the cool, slacker guy. He’s the Stifler character from American pie movies, all grown up. That certainly was his role in his breakout movie The Hangover (which has since turned into a trilogy), as well as most of his other films. Here, he gets the chance to be something different. In Silver Linings Playbook, he’s playing a guy who is a little crazy. Pat is not Mr. Cool. Instead, he’s mister awkward. He says more inappropriate things than appropriate things, as one character points out to him. And he also has very poor temper control. When he finishes an Ernest Hemingway book, early in the film, and is unhappy with the way it ends, he throws the book through a glass window. It’s the middle of the night, and this wakes his parents up and causes a huge commotion. And pat doesn’t even realize that what he did was wrong. He is so enraged with Ernest Hemingway that he can’t see past that. In the first half of the movie, all pats wants to do is get back with his ex-wife. This woman, Nikki, cheated on him with another teacher at the school where she works, and pat caught them both in the shower together. He beat that teacher up and Nikki left him, and that’s when pat went crazy and got sent off to an institution. Now, he makes it his goal to get her back. He exercises to get in shape for her and sets out to read all of the book on her syllabus that she teaches. The first half is mostly spent with pat working on these goals and having conversations with his parents. Robert Deniro and jack weaver plays them. Both of them give pretty great performances. Deniro’s character, pat sr., is a football fanatic and a die-hard eagles fan. He’s also a chronic gambler and has turned into someone who bets on games for a living. He makes tremendous bets at a time, any one of which could easily take his nest egg of saved up money away from him. As the movie comes close to reaching it’s halfway point, or so it seems, pat meets tiffany. Jennifer Lawrence plays her, all grown up. Lawrence the actress is only 22 years old, but she is made to look like someone who could be compatible with Bradley cooper. She plays a character that was married to a cop and is now a widow. Pat meets her because she is the sister of his best friend’s wife. That wife is a also good friend with Nikki. Pat and tiffany don’t exactly hit it off right away. In fact it really takes them the duration of the movie to figure out if they like each other or not. That’s kind of cool. For most of the movie, pat is pining after his ex-wife, trying to come up with ways that he can get her back. When he learns that tiffany sees Nikki sometimes, over at her sister’s house, he conspires to write a letter to Nikki and have tiffany get it to her. Tiffany makes pat agree to a partake in a dance competition with her, and suddenly we have the storyline for the second half of the film. It gets interesting when tiffany does give over the letter and then gives pat another letter that is Nikki’s response. What’s great is that aside from everything going on with these two, there’s also the Deniro character, working his own things out, throughout the film. That character gets involved in some major bets and ends up combining his football bet with the dance competition. It’s a pretty cool way of brining the two story lines together. I give this movie a lot of credit for steering clear of the usual clichés, such as having pat sr. get into trouble with bookies or anything like that. Instead, the people he owes money to are his friends. The bets might involve lots of money, but they are with guys who are close to him and come over the house on a regular basis. And the main plot, of course, about pat and tiffany, is a whole lot of fun. I love the way that for a large portion of the film, he finds her annoying. When he’s out running and she keeps showing up, running right in front of him, as if from out of nowhere, it is hilarious. So are his reactions to her. This movie is smart, creative, and a whole lot of fun. It has been Oscar nominated in all four acting categories, for cooper, Lawrence, Deniro, and weaver. The acting is great, but the screenplay is even better. What an enjoyable film.